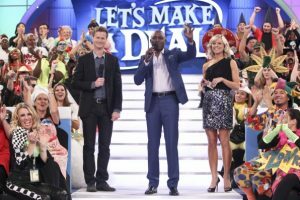 “Let’s Make a Deal,” with host Wayne Brady. “Big Brother”‘s reason for taking this long to make the switch to HD is the complexity of filming the show. They apparently had to rewire/upgrade the cameras that shoot footage in the show’s fake house set. However, I have no idea what took “Let’s Make a Deal” so long to switch, when it’s just a basic game show. Wikipedia says the first HD broadcast on network TV was the 2000 Super Bowl game. Thus, it took 14 years for the US to transition completely to HD. It’s also about how long it took the US to switch from black-and-white to full color programming. The first color TV broadcast on network TV was the 1954 Rose Parade. The final first-run black-and-white commercial network TV show was a bit harder to pin down, thanks to conflicting/incomplete answers via Google/Wikipedia searching. But as far as I can tell, the final such shows were daytime game shows “Everybody’s Talking” and “The Family Game.” Both shows were cancelled on the same date: Friday, December 29, 1967. Counting non-commercial television, the first season of “Mr. Rogers Neighborhood” (on PBS predecessor network NET) was in black-and-white. It switched to color in February 1969, which would make 15 years for US TV networks to fully go color. Why did the switch to HD go faster than color? Over the same 14-15 year time span, HDTV sets sold much faster than color TV sets did. By 2009, half of US households had HD-capable TVs (just nine years after the first network HD broadcast), while it took until 1972 (18 years after that Rose Parade telecast) for half of US households to have color sets. Set prices mighty’ve dropped much more quickly for HDTVs. Manufacturers stopped making CRT TV sets much more quickly than they stopped making black-and-white ones. Our family had a 13″ B&W set in the 1980s, and such sets were still being sold even into the 90s. The 2009 analog-to-digital switchover in broadcasting might’ve given TV sales a boost. Color broadcasting debuted in the United States in the mid-50s. This was when most people were still buying their first TV sets period. It took quite awhile for most TV programming to move to color (as shown above), along with upgrades to color broadcasting equipment for stations outside the largest cities. Since you knew of “Secret Storm” in 1968 being B&W, could you tell me the last US else does to be *filmed* in B and W? Somebody asked me that and I can’t find the answer. Any help would be appreciated. That I don’t know, I’m afraid. I mostly got my information from Wikipedia/a Google search. But good luck! Well, there’s the efforts (so far failed) to promote 3D TV and similar/related technologies (VR, etc.). But 4K is the current new thing to promote.